Of course I wanted these dolls! I pictured opening a box that contained dolls that looked like Barbie and Ken, or better yet, my beloved Liddle Kiddles. 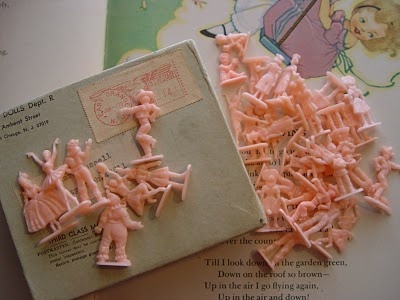 They were teeny, tiny plastic figures that looked more like little cake decorations. Sigh. A lesson learned! 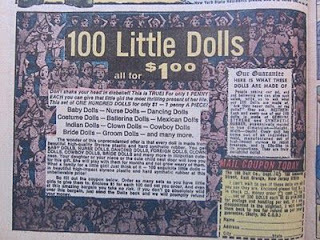 Do you remember the ads for 100 dolls in comic books? Did you ever order anything else advertised in the comic book ads? I'd love to hear from you in the comments section, below. I was always tempted to buy the x-ray glasses. Loved your story about the doll disappointment. I never ordered anything like that, but I was always disappointed in the surprise toy from Cracker Jacks. Bob - what would you have done with x-ray specs? Mary - ah yes, Cracker Jack prizes! I remember those well!